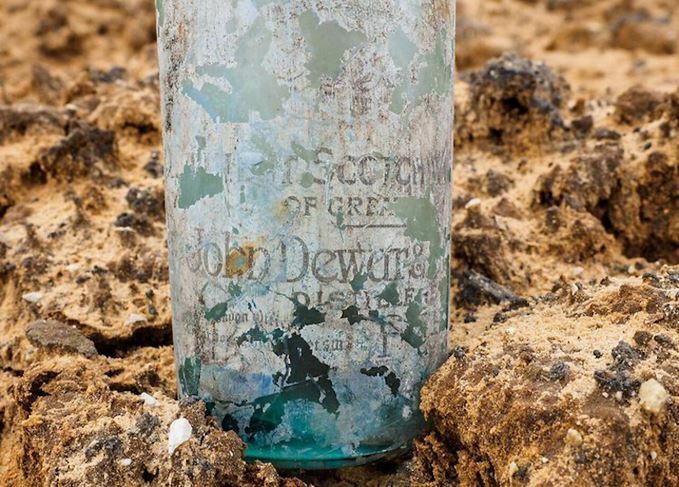 Hundreds of century-old liquor bottles, including Dewar’s blended Scotch and Gordon’s gin, have been unearthed by archaeologists investigating a First World War British Army garrison in Israel. The Israel Antiquities Authority made the finds – the first of their kind in the country – near the city of Ramla, south-east of Tel-Aviv in central Israel, during an excavation undertaken as part of the construction of a new road. A destroyed building of the Ottoman period would have housed the soldiers of the Egyptian Expeditionary Force under General Edmund Allenby, who were based at Ramla and Sarafand Camps for about nine months from November 1917. As well as a wealth of military artefacts in the ruins of the main building, archaeologists also discovered a refuse pit nearby, containing ‘an enormous number’ of liquor and soft drink bottles, plus broken crockery and cutlery. One of the bottles photographed is clearly a Dewar’s blended Scotch bottle, while another has ‘Gordon’s Dry Gin’ embossed on it. ‘The written historical evidence regarding the soldiers’ activities in the British Army in Israel usually consists of “dry” details, such as the number of soldiers, direction of attack, and the results of the battle,’ said Ron Toueg, excavation director. ‘During the war years we supplied large quantities of our whisky for the use of the troops at home and overseas. The new blended Scotch range has been made using an ‘innovative four-step ageing process’.